The Hunter 53091 Builder Deluxe fan is ideal for anyone who wants to balance traditional and contemporary style, and its ability to blend in with almost any décor has made it a best-seller. Suitable for rooms up to 400 square feet, the fan has 52-inch blades and is available in all white or either cherry/oak with brushed nickel or oil-rubbed bronze accents. The motor is backed by a limited lifetime warranty. A bowl light requiring two 60-watt candelabra bulbs is included with the Hunter 53091, but the fan can be installed without the light, too. Some owners warn that the light is too dim to be the only light source in a large room, however. Installation itself is easy, reviewers say, with straight-forward instructions that smooth the process even for first-timers. The fan can be installed using standard, flush or angled mounting for extra versatility. Other features include a reversible motor and pull-chain operation. While some reviewers are disappointed that it doesn’t come with a remote, others say it’s easy to add one later. Owners rave about how quiet this fan is, even on higher speeds. Design-lovers will definitely want to check out the Minka Aire Light Wave, which is equal parts ceiling fan and eye-catching sculpture with its three gracefully rounded, twisting blades. The 52-inch fan is suited for rooms up to 400 square feet, though reviewers say the sleek blades make it a good choice for larger bedrooms, too. The fan comes in all white, silver, and distressed koa. The latter is the best bet for traditionalists who want a warmer look, reviewers say. The motor is backed by a limited lifetime warranty. The three-speed Light Wave comes with an integrated 17-watt LED light that reviewers say easily illuminates even a larger room, but it can also be dimmed for those who prefer lower-level mood lighting. Most owners say installation is seamless and quick. A 4.5- and 6-inch downrod are included, but very high or vaulted ceilings will probably require longer rods that can be purchased separately. This fan cannot be mounted flush with the ceiling. It comes with a remote control and the fan is reversible. While most owners say it’s quiet, some owners report a loud hum after installation. Running the fan for 24 hours may reduce or eliminate the noise, according to the manual. For a fan that keeps cool air circulating in your bedroom without looking out of place or like an eye sore, consider this dan from Hunter. The fan features a WhisperWind motor which keeps the sound to a minimum so you can run your fan while still getting a good night of sleep. The blades are reversible; one side has dark walnut wood and the other has cherry so you can assemble the fan to fit your bedroom's overall vibe and design elements. This fan also has a light, a nice addition for a bedroom fan. Reviewers are impressed by this fan's abilities for its very affordable price. "This fan is awesome! It's small but packs a punch," wrote one reviewer. "It is also so cute. Great for a bedroom or office." A quality, affordable ceiling fan isn’t difficult to find if you know what to look for. Inexpensive fans can still last years with periodic use, regardless of the season. The Hampton Bay Middleton 42" fan is the perfect choice to save some money without sacrificing on the quality. The fan is large enough to circulate air in small rooms around the house. Next, to the price tag, the best thing about this fan is the flexibility it offers. The five fan blades are reversible so you can choose between a maple or cherry finish. The white globe light matches a variety of interior decor styles ranging from traditional to modern. The entire setup is energy efficient and easy to install with the included mounts and lighting kit. Anyone searching for a durable outdoor ceiling fan will want to take a look at the Energy Star-rated Hunter Bayview, which is optimized for use in damp outdoor environments such as covered porches or patios. This fan has five durable plastic 54-inch blades, meaning it can move a ton of air in spaces up to roughly 485 square feet. It comes in either white with white blades or muted gold with dark brown blades. The Bayview features a reversible WhisperWind motor that is meant to minimize noise on all settings, and a three-speed pull-chain control. The motor is backed by a limited lifetime warranty. It can be installed any way owners need – flush mounted and angle mounted included. Most reviewers say installation is easy, and they especially love the design for tropical-style patios and sunrooms. More importantly, they say this fan does what it needs to – moves a lot of air quietly. It does not come with a light, but a light kit can be added. Modern design can be streamlined, simple and versatile, and that’s exactly what you get with the Monte Carlo 5DI52PND ceiling fan, owners say. This five-blade fan measures 52 inches across and is ideal for living rooms or large bedrooms. It comes in enough colors to blend with any décor – brushed steel, matte black, white, roman bronze and polished nickel – and is backed by a limited lifetime warranty. This three-speed Monte Carlo has an opaque dome light that requires one 75-watt mini candelabra bulb. As is often the case with ceiling fan lights, reviewers warn that it isn’t the brightest light and shouldn’t be the sole lighting source for the room. Most owners say installation is simple, especially for those who’ve previously installed a ceiling fan. While it includes a downrod, the fan can also be flush mounted in rooms with lower ceilings. The motor is reversible and comes with pull-chain controls, but remote and wall-mount controls can be purchased separately. Most owners have written that it is very quiet, though a few report a slight hum. 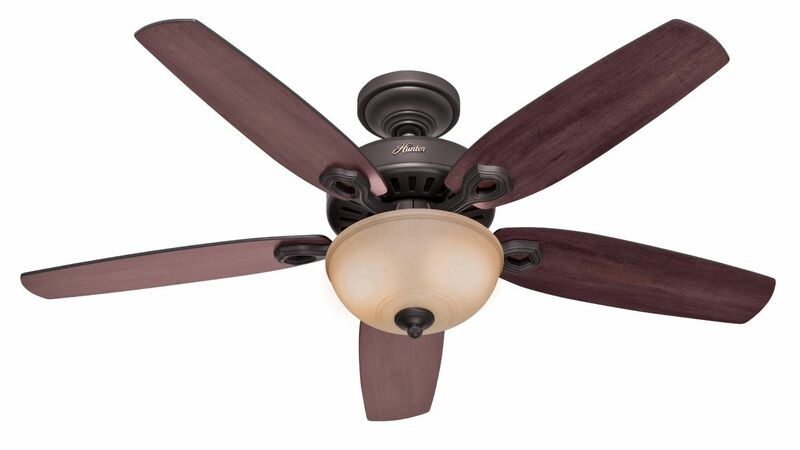 Buyers who want a reasonably priced, classic-looking ceiling fan should consider the Hunter 53237. Suitable for rooms up to 485 square feet, this five-blade fan can easily handle family rooms and other large spaces. It comes in brushed nickel and Brazilian cherry; oil-rubbed bronze and mahogany; or all white. The motor is backed by a limited lifetime warranty. The Hunter 53237 comes with a light fixture that has three bell-shaped, swirled glass shades, but the fan can be installed without the light as well. Three 60-watt candelabra bulbs are included. Reviewers say the fixture gives off a soft light that is fine for a bedroom, but probably not enough for larger spaces. Installation gets mixed reviews: Some say it’s fairly easy, but others warn it’s a little more involved than comparable fans. This three-speed fan can be installed using standard, flush, or angled mounting. Other features include a reversible motor and pull-chain operation, though reviewers say it’s easy enough to add a remote. Another plus: Noise is next to non-existent, reviewers say. We bought two top-rated ceiling fans and our reviewers tested them daily for weeks on end. We asked our testers to consider the most important features when using these ceiling fans, from their coverage areas to their accessories (like a remote control). We’ve outlined the key takeaways here so that you, too, know what to look for when shopping. Coverage Coverage area is one of the most important considerations when picking a ceiling fan — if it’s too small, it won’t adequately cool a large room. For rooms up to 75 square feet, consider a fan between 29 and 36 inches; for rooms between 76 and 144 square feet, consider a fan between 36 and 42 inches; for rooms between 145 and 225 square feet, choose a 44-inch fan; and for rooms above 225 square feet, choose a fan between 50 and 54 inches. 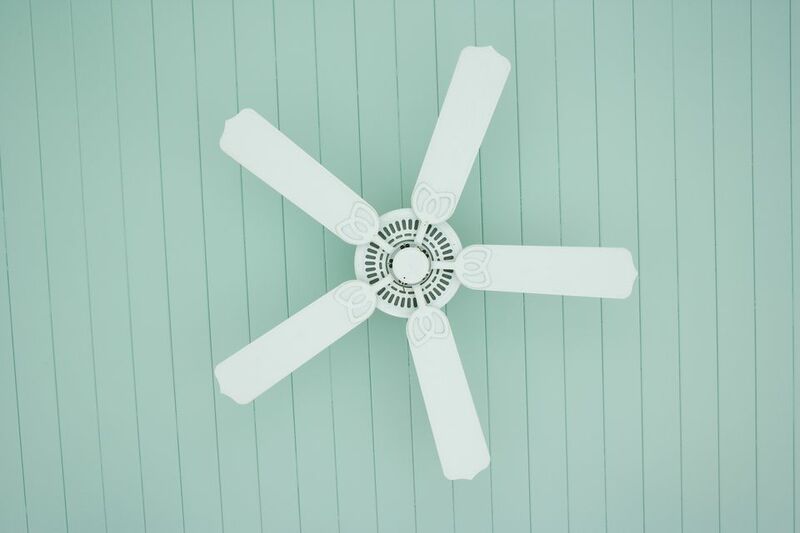 Mount The bottom of a ceiling fan should be at least eight feet from the ground. If your ceiling is lower than nine feet, choose a flush mount, which is installed directly against the ceiling. If your ceiling is nine feet, try a six-inch downrod; if your ceiling is 10 feet, try a 12-inch downrod; if your ceiling is 12 feet, try a 24-inch downrod; and if your ceiling is more than 14 feet, a downrod that’s 36 inches or more will do the trick. Accessories Though a lighting kit is the most common — and most helpful — accessory, ceiling fans can also come equipped with other extras like remote controls, decorative medallions, and decorative pull chains. Think about which ones might suit your home best. This fan, according to one of our testers, was “modern and sleek because of its three blades and color.” Our reviewers also thought it was effective at moving air, and one loved its “useful” remote that came included. In terms of negatives, one tester felt that the color of the light was a bit harsh: “It's a bright white instead of a soft white,” she said. “It does hurt the eyes a little if you leave it on for too long.” Our reviewers also noted that the fan made a slight humming noise when it was on.